de Quervain tenosynovitis causes pain in your thumb joint because it affects two thumb tendons. These tendons are called the the abductor pollicis longus and the extensor pollicis brevis. The tendons from these two muscles travel side by side. They pass through a synovial tunnel near the thumb side of your wrist. Because of the coating in this tunnel which is called tenosynovium, it allows the two tendons to glide easily back and forth as the thumb moves. 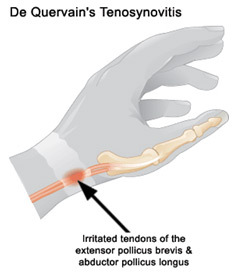 When the tenosynovium becomes inflamed along with the tendon, this is called tenosynovitis. Poor hand posture and overuse of the hand may cause de Quervain tenosynovitis. It is commonly known as blackberry thumb or candy crush thumb. Many patients that have been recently holding a newborn baby tend to come down with this condition as well. Repeated grasping, pinching and squeezing many lead to inflammation. What are my symptoms of de Quervain Tenosynovitis? There will usually be soreness on the thumb side of the forearm near the wrist. Pain may spread up the forearm or further down into the wrist and thumb if left untreated. You may start to hear a clicking sound as you move your thumb which is called crepitus. Swelling and pain may be present as well. How do I know if I have de Quervain Tenosynovitis ? The diagnosis of de Quervain’s tenosynovitis is normally confirmed through an orthopedic test called Finklestein test. How would I Treat de Quervain Tenosynovitis? Make an appointment below to start your recovery. Ultrasound and A.R.T are a few of the treatments that will be used to assist your recovery. At home you will want to stop all activities that cause your symptoms. Try and keep your wrist in a neutral alignment and avoid bending your wrist forward or backward. If there is still pain, you may be referred to an Orthropedic Doctor.